Installing a go kart throttle cable assembly is a snap. This guide will show you what parts to get. 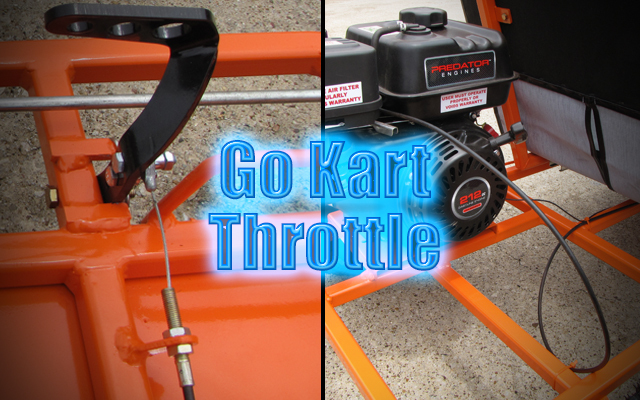 Go kart throttle setup instructions include the go kart throttle pedal, return spring, cable, and engine linkages. 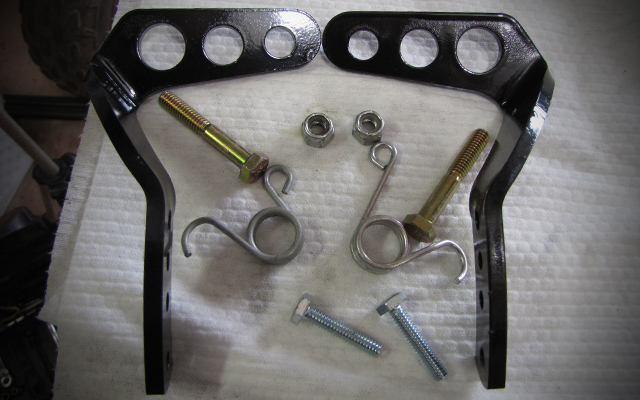 The go kart throttle pedal (also known as a gas pedal) is the one on the right of the picture with its associated return spring and hardware used to mount it to the go kart frame. Looking at the gas pedal, you will notice there are four small holes on the lower portion of the pedal. The lowest one is for the 5/16″ pivot bolt, the 3rd one up is for the go kart throttle return spring, and the top one is for the actual go kart throttle cable eyelet. 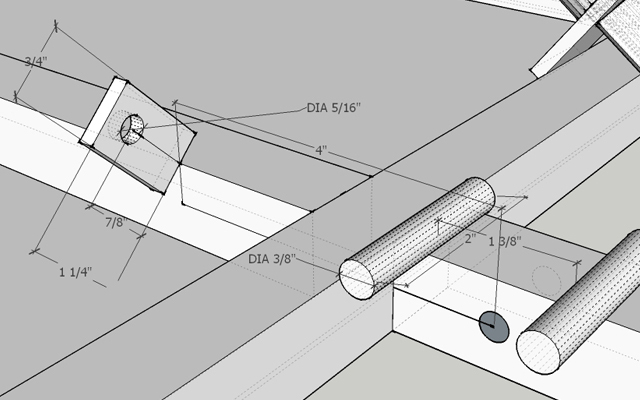 Pedal Stops: It is a relatively straightforward process to weld up the pedal stops. Just like the brake pedal stops that we created, you will do the same thing for the throttle pedal. This will limit the travel of the throttle pedal so your cable will not stretch out if you push on the gas too much, nor will it allow the pedal to hit the tie rods as you step on the gas. Cable Tab: Weld the throttle cable tab on about a 45 degree angle on the center beam of the kart. The tab should be spaced 4″ back from the center of the throttle pivot hole. When the cable is bolted to this bracket or tab, it should face where the eyelet will hook up to the pedal. One can eyeball where to weld it after it has been tacked into place, then use a hammer and pliers to position it just right. Make the final welds when the cable is not hooked up, or you could melt the protective covering off of the cable housing. After you have the throttle pedal, stops, and cable tab installed, it is time to install the go kart throttle cable. Referencing the picture above, you simply unscrew one of the bolts on the cable housing, and slide the end through the tab’s 5/16″ hole. You will need to remove the inside cable from the housing to do this. Afterwards, just bolt up the cable’s eyelet to the throttle pedal on the top hole, and reinsert the cable inside the housing. Tip: As the cable stretches over time, you can either adjust the slack in the cable at the engine side, or near the gas pedal. Referencing the same picture above, the top portion shows the end of the cable housing as it is bolted to the engine’s throttle plate. The cable then goes through the throttle stop, and is secured with a small screw. The throttle plate pictured above is the most common type of linkage you will see on Honda, and Predator engines. 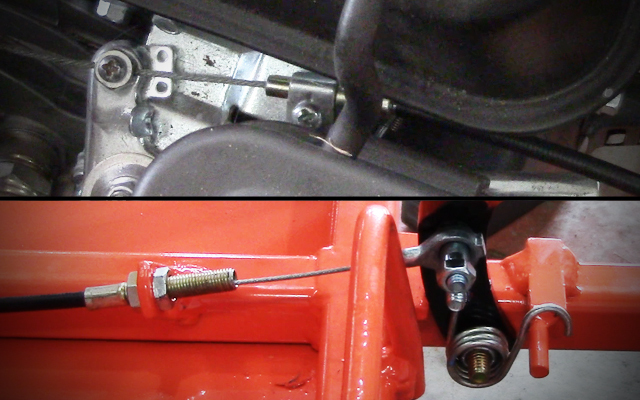 If you are not sure how to hook up a throttle cable on your specific engine, check your user’s manual for something like ‘remote throttle linkage’ instructions. Now that the go kart throttle cable and associated linkages are made, you are pretty much done with the go kart fabrication. You could sit on it and drive, but there are a few more extras you should consider fabricating to make the kart safer, or cooler, or both. Lets have a look at these options before we paint it. Hey KartFab.com can you guys help me out and suggest a engine that is cheap but has a desist amount of speed for a 13 or 14 year old? If you guys can help me out thank you guys so much. If so can you respond to this plz? And if so thx. predator 212 cc for a small kart, predator 420cc for a two seat kart or very large one seat kart. Where do I install a spring to return the throttle to an idle position? Again, check out the link in the article for the return spring but it goes around the bolt that holds the pedal, and there are pictures and video of this in the article here. Want to build a kart for my 10 year old but would like to start with the top speed really governed down. All the info I find is about removing the governor. To keep speed down am I adjusting the governor or just the throttle screw. Still want low end acceleration, just not high end speed when neighborhood kids are all driving it on my block. you can adjust the throttle screw and be fine to a point. If you adjust throttle screw too low, then that’s when you cut into acceleration. You can adjust the governor a little bit, but not like you can with the throttle screw. If you are really concerned about retaining acceleration, you can make a jack shaft, and just swap out the sprockets as needed to change the gear ratio later. Something like 10t cluch to 20t jackshaft in, then 10t jackshaft out to 50t axle. This is just an example. Where do you buy the the kit at i mean…..
can you move the attachment point of the throttle cable higher up on the pedal for more throttle travel? I’ve taken my front brake and gas pedal off this CL project and am wondering if you could post a full pic of the front end of a similar kart and how these go back on? Thanks Kartfab! Here’s a pic it’s from a Fox Tracer LXT (Manco), model#485B-2, American Sportworks. I posted pictures of the pedals in the reassembly page.